Educational Qualification: The desirous and keen individuals must be 12th or Graduation or PG Degree with D.El.Ed/ B.El.Ed/ B.Ed/ BA.Ed/ B.Sc.Ed & TET from a recognized Board / University / Institute. Processing fee of 350/- is required from candidates belonging to General Category Candidates to be paid. Applicants belonging to OBC category are required to paid Rs. 250/- as processing fee. The contestants applying for the posts should be existing between 21 to 35 Years (for male), 21 to 45 Years (for female) As on 01-01-2019. Salary And Payscale: After getting the selection for the vacant Posts, a pay band of Pay Matrix of Level-09 (Post 1), Level-08 (Post 2,3,8), Level-06 (Post 4-7,9,10) Per month shall be offered to the candidates. Contenders willing to apply for DSE vacancy should visit to the official website that is http://www.cgvyapam.choice.gov.in. Online Registration of Application Form Is Starts From : 16, 26-04-2019 & 07, 14-05-2019. Dead Line For Apply Online : 12, 26-05-2019 & 09, 16-06-2019. 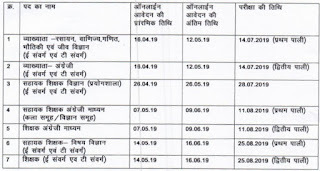 Click Here For DSE Recruitment 2019 Detailed Notification 1. 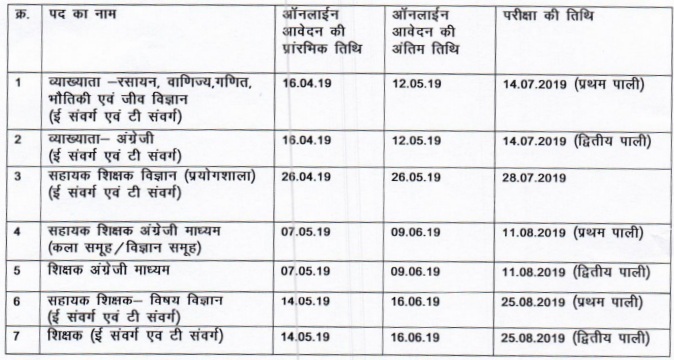 Click Here For DSE Recruitment 2019 Detailed Notification 2.